If you’re looking to buy gas fireplaces there are a few questions you should ask yourself. What kind of venting system will work best for your home? Where will you put the fireplace and how big do you want it to be? What style of fireplace are you seeking: traditional or modern? Will it be built in, or free standing? What materials will it be made of? And finally, once you’ve decided on all of the specifics, where will you go to buy this fireplace? This article will walk you step by step through those questions, exploring the options you can expect to find in your search for the fireplace of your dreams. We will be using Embers Living as our basis for the examples in this article due to the wide variety of fireplace options available on their site. This will help you to get an idea of the range of fireplaces you can expect to find in your search, as well as giving you a starting point when it comes time to shop for the fireplace you want. 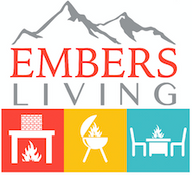 Embers Living is one of the most beginner friendly fireplace stores in the market thanks to their wealth of informative online videos that give in depth explanations of their products. A new customer can visit their site and gain the same knowledge and advice from an expert as they would receive in person at the showroom. This puts them a step above other online stores and speaks to a level of professionalism that has earned the trust of thousands of happy customers. If you know you’re seeking to buy gas fireplaces then you’ve already made the first most important decision: deciding what your fuel source will be. This makes it easy to eliminate choices that won’t fit in with your home design, and gives you a good starting point when browsing through Embers Living’s site. Like many fireplace stores, Embers Living sorts their site’s catalog by fuel type, then venting method, then style, a system that neatly lays out the order of decisions you need to make. There are three vent styles you’ll have to choose from when picking your fireplace. Vent free styles are self-explanatory, of course. Next come direct vents and B-vents. If you are planning on having a built in fireplace it is important to understand the difference between the two, as direct vents are more flexible and allow for a greater variety of placement options than B-vent fireplaces will. Direct vents utilize a double-wall pipe that allows them to pull the air that feeds your fire in from the outdoors and expel the exhaust your fire produces simultaneously. The exhaust pipe can exit the home vertically or horizontally, giving you more placement options than you would have with a B-vent, whose exhaust pipe must exit vertically. Direct vents are typically sealed with ceramic glass that doubles as insulation and amplifies the heat produced by the fireplace, making them powerful sources of warmth in the colder months. On the other hand, B-vent fireplaces must be open, as they draw their air from the room they are in rather than the outdoors, having only one wall pipe that is used exclusively for exhaust. B-vents are loved for their traditional appearance more so than their heat efficiency, and are often favored by people who want to add a fireplace to their home for the visual effect. Once you’ve decided on the venting system your fireplace will use, you will be able to narrow your search further as you move on to consider the visual aspects of its style. All of Embers Living’s B-vent fireplaces are in traditional styles, so if you’re seeking a modern look, you’ll want to turn to direct vents instead. Direct vents are available in either modern or traditional styles, so choosing whether you want the classic stately mantel or a sleeker linear fireplace wall inset will help you to filter through the wide range that is available. As for size and materials, this primarily depends on your preferences. Consider where you want the fireplace, how much space you’re willing to afford it, and how it will look in your home. Every fireplace on Embers Living’s site has full details on its materials as well as pictures to help you visualize exactly what you’ll be getting when you order and how it will appear once it is installed. If you still aren’t certain what you want after you’ve worked through the steps we have here, Embers Living’s professionals are always ready to take calls and answer questions to help you choose the perfect fireplace for your home.